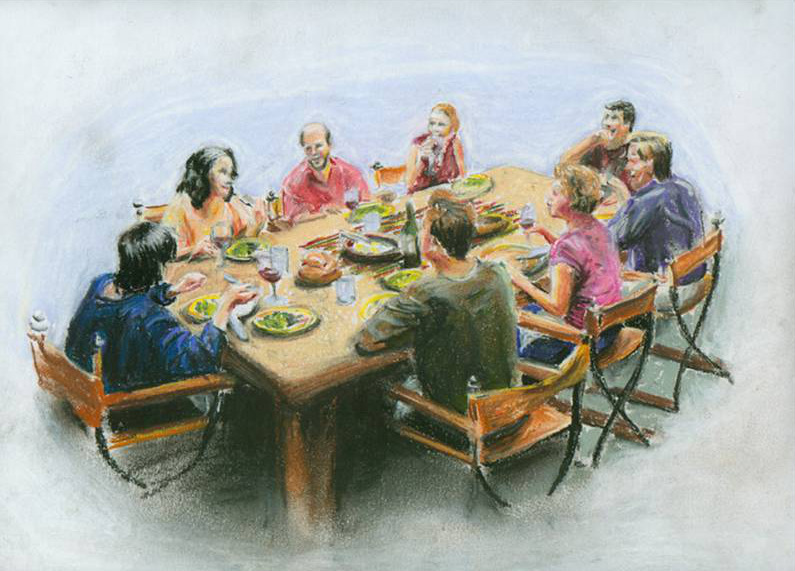 eat with everyone: the outcasts, sinners, the rich and poor, friends and strangers. 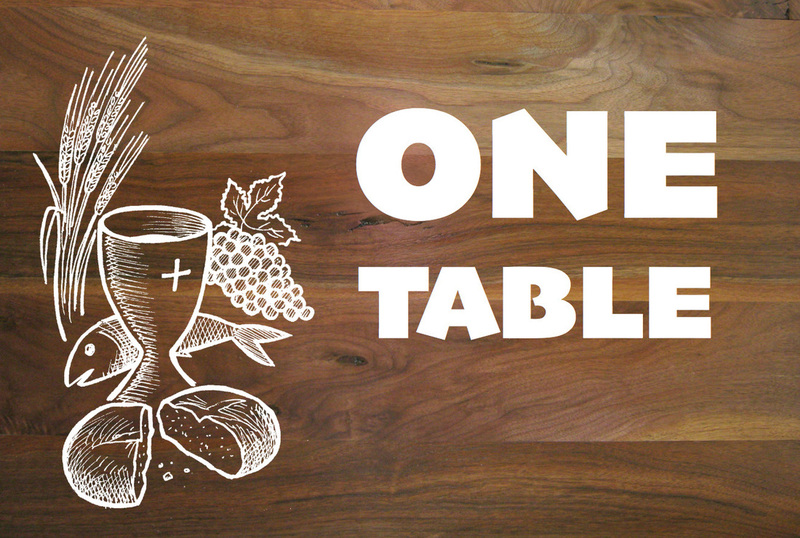 Ten meals serve as key turning points in Jesus' ministry in the Gospel of Luke. 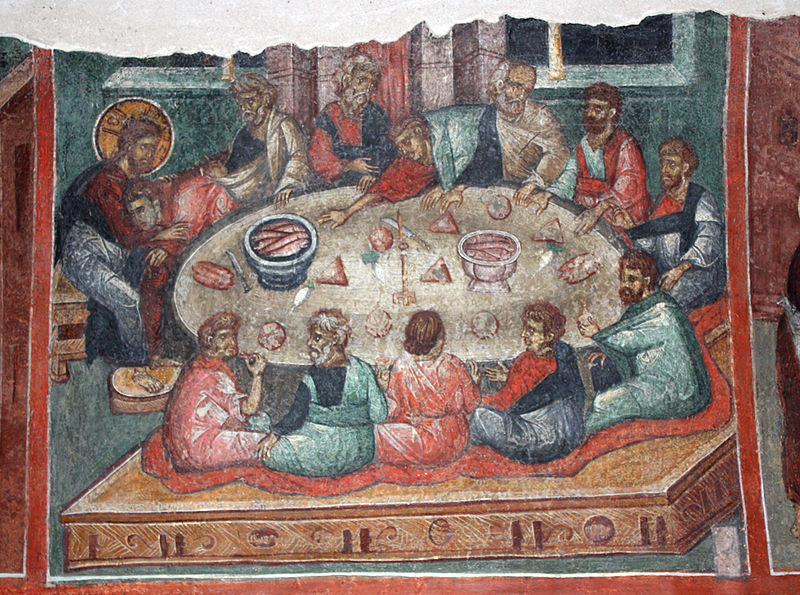 Some suggest that the meal is the the organizing structure for the whole Gospel. New Testament scholar Markus Barth says, "In approximately one-fifth of the sentences in Luke’s Gospel and in Acts, meals play a conspicuous role." Robert Karris, another Scripture scholar, says, "In Luke’s Gospel Jesus is either going to a meal, at a meal, or coming from a meal." Jesus chose a symbol to leave behind, to help us recall him and the community to which we belong. He didn't leave behind a theology system, a moral code, a textbook, or even an organized church. He left behind a meal. Then He Came Back to Eat! [T]he Son of Man has come eating and drinking, and you say, "Look, a glutton and a drunkard, a friend of tax collectors and sinners!" At dinner, Jesus took bread and wine, the commonly available, everyday elements of a meal in that time and place. He then broke the bread and poured the wine both to remind his disciples of his life and teachings and to serve as an invitation to follow his acts of love and compassion. It is not accidental that Christ chose a meal for the setting and bread and wine as the symbols for instituting what has become the most central of Christian sacraments. The settings and elements of everyday meals carry within them a kind of "sacramental power." Michael Shut, "Food As Sacramental"
What Are Our Mealtimes Like? How Often Do We Eat Together? How Much Time Do We Spend Together? National Center for Substance Abuse at Columbia University. Jesus taught us how to have supper. When he ate, he was present to others at the table. It wasn't about efficiently eating food, but about community, friendship, healing, and much more. In fact, if we don't eat supper together--with our family, friends, neighbors--we really can't understand what Jesus was talking about or calling us to do. Having supper together means making time to be truly present to one another. In our overscheduled world, we can become caught up in doing everything as quickly and efficiently as possible, but this was definitely not Jesus' way. Instead, we need to remember how to ask about what is important, listen to each others' hearts, support each other, and share laughter. The Church lives in individual households, and a big part of sharing supper together is the art of homemaking. Faith is not lived out in the parish, but in our homes and everyday lives. How do we make the places we live into a place with a sense of belonging, welcoming, warmth, joy, and love? And how do we share this work together? This Christian call is for everyone, not just those with children or living in some kind of community. Living alone is a relatively modern experience, and it was relatively rare as recently as fifty years ago. Sharing supper can be a bigger challenge for those who live alone, but is just as important for them to reach out to others for community meals. 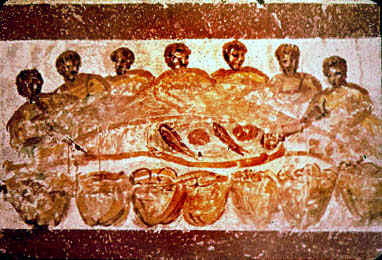 An early Christian agape meal, as depicted in the Christian catacombs. This may sound too simple, but when you cook and dine with others on a regular basis, reconciliation happens naturally. You simply cannot eat at table with people with whom you're on the outs. And when you dine together, a sense of agape (the early Christian love feast), emerges very quickly. You start to get the sense that some large non-verbal communication of love is going on that is not possible in any other context. A New Yorker story recently described the first family's dinner hour as "sacrosanct." As I have learned, our own family's dinner hour has resonated across time, space and generations. The conversation began innocuously enough on my daughter Carla's Facebook page. Sharing supper in our modern society only happens without some commitment and probably some sacrifice. If you dine together, Christ will be in your midst. It was in the breaking of the bread that the disciples recognized the risen Jesus on the road to Emmaeus. Put limits on your work time and other evening commitments (even church ones!). Plan the time so everyone can be present at the same time. Invite guests as often as you can. Have supper together as frequently as you can. This will make it something everyone can count on and fit it in the rhythm of the day. Get others involved in the preparation. If you have children, they may be able to do more than you think, from setting the table to preparing the food. Keep it simple so it's not too much work. Add something special, such as a candle or flowers. Set the table nicely. Turn off the television and all electronic devices. Really, turn off the phones. Start well. The word "eucharist" means thanksgiving, so consider beginning with a prayer (here are ideas for families with kids). Or you may choose to start with a toast or other ritual. Talk! Discuss the events of the day. What happened at school or at work? Everyone can share a “highlight” and “lowlight” of their day. Put on some good music to create some fun at clean-up time. How can I have supper this week the way Jesus taught us? Look at the tips above about "How to Have Supper" and make a commitment to sharing meals together differently this week (and month). Find more videos, books, and resources--especially for families with children--at the How to Have Supper page at GrowingUpCatholic.com.